Please call 1-877-715-9299 (toll-free) or email info@ontariobadgers.org if you have seen a badger in Ontario (alive or dead, past or present) or have found a possible badger burrow. The more promptly you can contact us the better, especially if you have found a dead badger. Ontario is home to a small population of North American Badgers. They are considered to be an endangered species, having been listed as a Species-at-Risk by both the Provincial and Federal governments. It is estimated that there are fewer than 200 badgers in the province. They face significant threats from vehicle collisions, disease, and habitat loss. Badgers in southern Ontario are also completely isolated from neighbouring badgers in Michigan, which raises the long term risk of inbreeding. Overall it would seem as though the odds are stacked against them. But not everything is bad news. We are learning that badgers are hardy animals and rather tolerant of human activity. They are adaptable and opportunistic, which can help them to make the most of situations that are less than ideal. They do not face outright persecution and their activities don't interfere with farming. In fact, farming in some areas is actually capable of creating suitable badger habitat. While this process is unintentional, and only occurs where farming is less intensive, it does mean that there may be steps that can be taken to make farming across Ontario more accommodating to wildlife, while maintaining profitability for farmers. So while it's safe to say that Ontario's badgers aren't doing well, it may be that the ingredients for successful conservation are all here. We just need to figure out the right mix. The Ontario Badger Project was begun in order to answer many of the questions necessary for badger conservation — regarding their distribution and abundance, the types of habitat and prey they require, main causes of mortality, and how they fit into the agricultural landscape of southern Ontario. 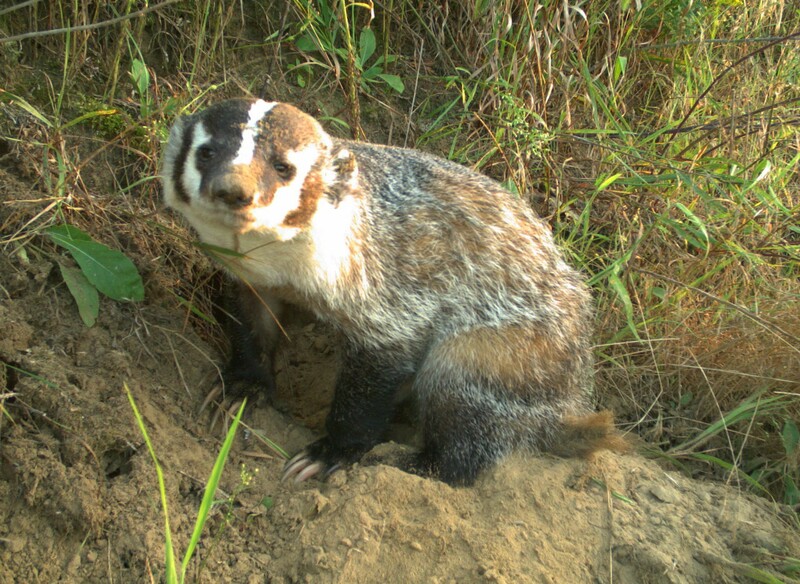 The content of this website is derived from our own research on badgers in Ontario as well as many published resources (listed in the Resources page) and personal communication with badger researchers elsewhere in North America. All pictures of badgers were taken in Ontario of Ontario badgers. Most were taken with motion-activated trail cameras at occupied burrows. Click on any image to see the full-sized original. Please contact us if you wish to use an image for educational purposes.